Keep on counting those stars because you're not just going to see a star but a superstar, not just band but a symphony! Indeed, two of Colorado's formidable forces in music are coming together in one concert stage. 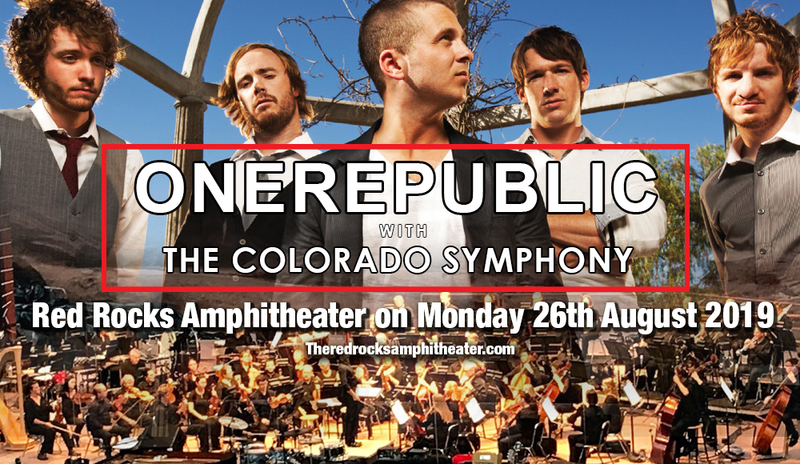 OneRepublic & The Colorado Symphony will illuminate the night with shining stars as they perform their hits at the Red Rocks Amphitheater on Monday 26th August 2019. OneRepublic will rock the venue with a staggering stack of hits, and The Colorado Symphony will amplify this sonic experience to soaring heights. Start with the first step by clicking on the 'buy tickets' button on this site; then you'll be well on your way to reach for the stars! OneRepublic has made an indelible imprint on the music landscape with their biggest fan-favorite chart-topper "Apologize". They made a huge follow-up with the single "Stop and Stare"; then delivered yet another knockout smash with "Counting Stars". With these singles alone, OneRepublic was elevated to pop-alt-rock luminary status. They've proven their songwriting chops lie beyond the Midas touch of star producer Timbaland, who remixed their previously released single "Apologize" and turned it into a best-seller and chart-topping hit for the band. The remixed version of the said song is their biggest hit so far. "Apologize" was toppled down from its number position by the song "Bleeding Love" by Leona Lewis, which coincidentally was written by Ryan Tedder, founder and chief songwriter of OneRepublic. It was indeed the sweetest revenge, so to speak, on the giant that is 'Apologize'. They just had to make their way out into the one-hit-wonder mold, with the best way they know how — release a new chart-topper, and that was "Stop and Stare". From there, the band continued to slay it with singles like “All The Right Moves,” “Marchin On” and “Good Life.” While Tedder solidified his reputation as a hit-making songwriter as he co-wrote Adele’s massive hit “Rumour Has It” and has also penned songs for U2, Jennifer Lopez, Leona Lewis, and others. Then in 2013, OneRepublic unleashed another monster hit with the anthemic single "Counting Stars". OneRepublic is originally from Colorado Springs, Colorado. Hence, it is such an extra-special treat that they will be performing with another Colorado treasure –The Colorado Symphony. Together, this is guaranteed to be an earth, or rather, a rock-rumbling show at the Red Rocks, so don't miss it!